At least one person has been killed and others are nursing injuries following an accident along Entebbe Road. The accident happened when an ambulance, Toyota Reg no 972G heading from Kibuye roundabout towards Kampala, collided with a trailer Reg no UBE 164 D heading to Entebbe. The incident occurred Tuesday at around 1:20am. 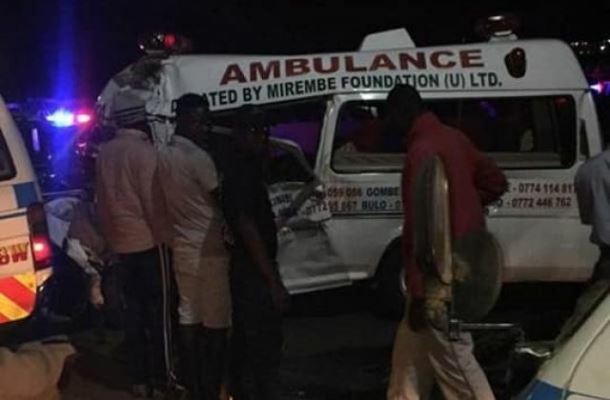 The Deputy Spokesperson Kampala Metropolitan Police ASP Luke Owoyesigire confirmed the incident and said one unidentified person lost his life on spot and the five people injured were rushed to Mulago hospital for treatment. “Both drivers are on the run unfortunately one person died and his body was taken to the mortuary for postmortem,” he said. He said investigations are still on going to establish the core reason for the accident.